The weather here in Los Angeles has been gorgeous this week and makes me feel the need to put up a nice Spring drink. The Kentucky Derby last Saturday had people drinking this all across the country, however most people think the original recipe uses Bourbon as the base. The recipe above is from the classic book How to mix drinks by Jerry Thomas, published in 1862. The Whiskey recipe, as most bartenders know it today, is also listed in Thomas’ book however it comes under the title of a ‘Whiskey Julep’ instead. According to Jerry Thomas this is an American drink that was introduced to England by Captain Marryatt. In my opinion this drink is like an ‘adult slushy’ due to the copious amounts of ice and how sweet and refreshing the drink is. 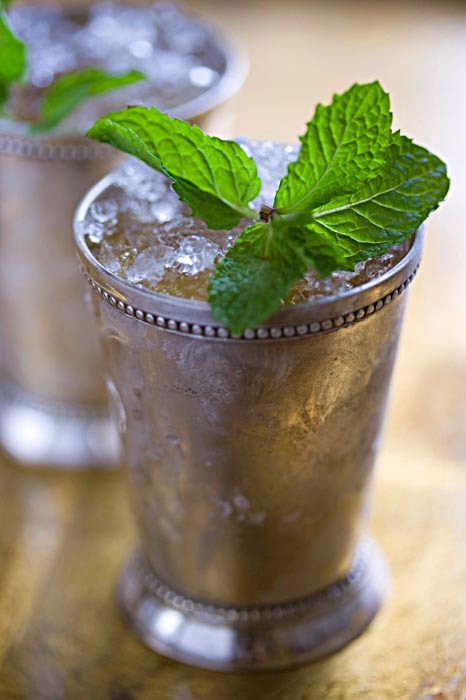 It is a member of the ‘Smash’ family, which are a genre of drinks served over crushed ice and is supposed to be served in a julep cup (a metal cup made of silver or pewter), designed to keep the drink icy cold. The picture Jerry Thomas drew of a julep in his book shows an extravagant garnish, which I believe to be an important part of the drink and makes every sip smell of minty freshness. A perfect choice for a hot sunny day.